I actually watched this 1979 classic for the first time last year, and recommend it thoroughly. All the different gangs with their various themes and crazy style, all the running, all the mad violence – it’s all there. 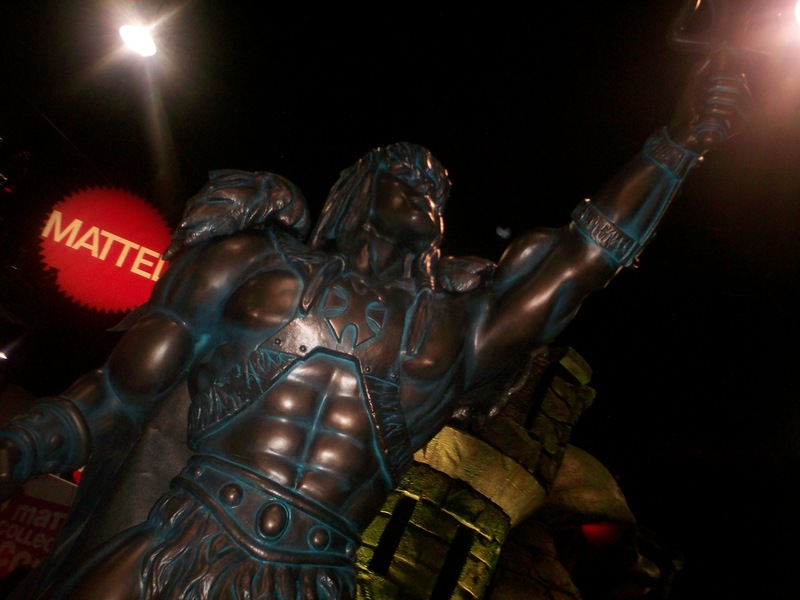 The tie-in game was pretty cool too. Now there’s a comic. Straight from the DB Bros. press release to your fanboy mind, here’s all the info you need to know. Dabel Brothers Publishing is pleased to announce the comic book adaptation of the cult movie classic, The Warriors. The Dabels will start with an adaptation of the movie and move onto doing spin off stories based on the movie. This will be the Dabel Brothers first movie to comic book adaptation. 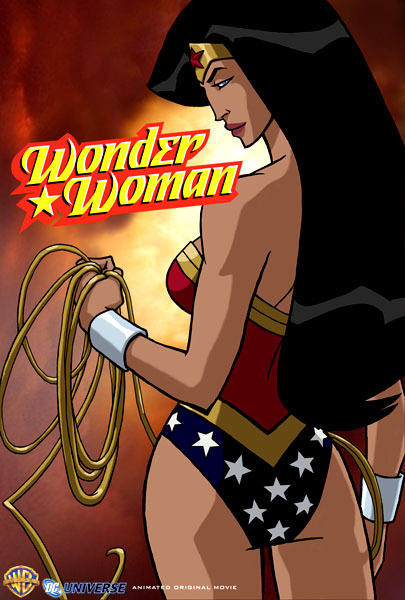 The Wonder Woman animated project will be released in February next year. It’s written by comic scribe Gail Simone and features a great voice cast including Keri Russel as WW, Rosario Dawson as Artemis and Alfred Molina as war god Ares. The trailer was unveiled at Comic-Con, along with details on a host of other animated DVD projects, which you can see and read about here, including a possible CGI Kingdom Come film. Further Batman films, a Catwoman film and a Fourth World film with the New Gods are also possibilities. Superman: Doomsday, Justice League: New Frontier and Batman: Gotham Knight have kicked things off with a bang, and it looks like more exciting films will follow. And if that’s not enough, go here for BET’s faithful Marvel adaptation of Black Panther, debuting at the same time as WW. 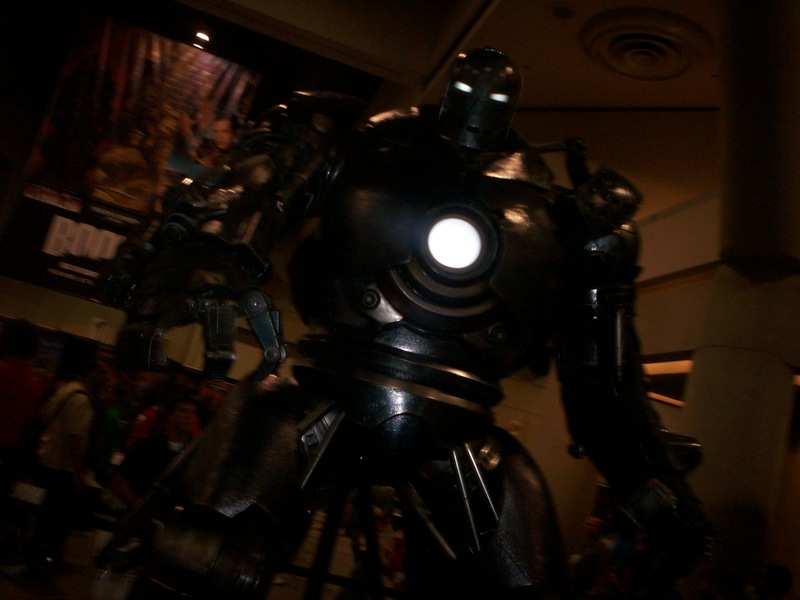 Apart from crowds, costumes, coffee and comics, there was something else at Comic-Con – Christians! 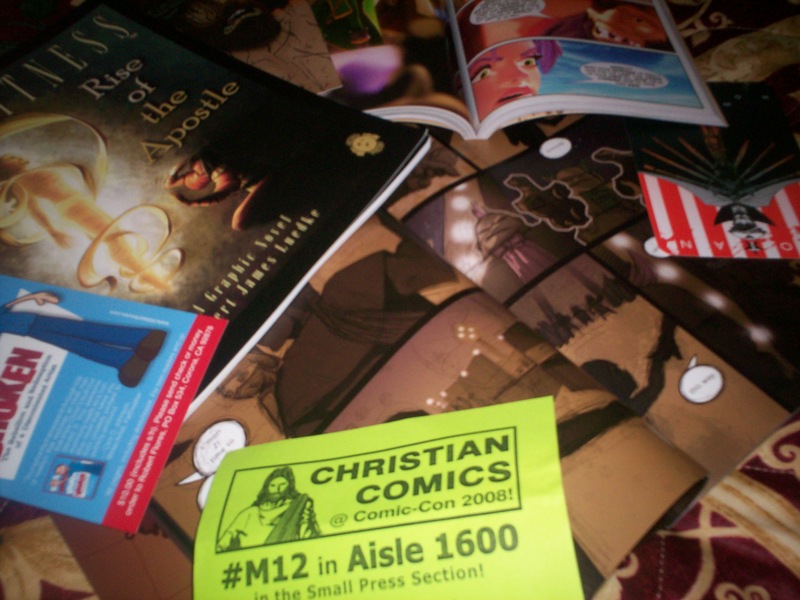 I saw a flyer for CCAS (that’s Christian Comic Arts Society) on the always popular freebies table, so I had to go. The guys and girls from CCAS have been going to the Con for the last 12 years, shining the light. They have seen many Christian companies come and go during that time, but have been blessed enough to always get a table, and have continued growing in numbers. It’s encouraging to see such talented, humble believers using the gifts God has given them. The first of the three panels was entitled, “Spirituality in Comics,” and had an eclectic mix of panelists, including Captain Marvel expert and Alter-Ego writer, P.C Hamerlinck, Cory Edwards (writer/director of Hoodwinked and the upcoming Fraggle Rock: The Movie), Scott Wong (Brethren Entertainment) and Holly Golightly (Broadsword Comics). It was hosted by author Leo Partible. You gotta love the Con – where else would you find a bunch of Christians and a self-declared witch discussing the same topic? There were plenty of laughs and light-hearted discussions all focused on the portrayal of spirituality within the medium of sequential art. The highlights included the love of Japanese artists for anything remotely religious to cram into their work. (The CEO of Squaresoft has apparently never read the Bible, but most of his video game designers get their information from the Internet and take what they like, thereby giving the world the dazzling mix of “nuns with guns.”) and the similarities between Emperor Palpatine and Oprah. Saturday night was a time of networking and fellowship hosted by the CCAS team. We had a great time getting to know other believers and encouraging one another in our work. After prayer and a brief history of CCAS we mingled and laughed loudly for the next 3 hours. According to CCAS, this has been their most successful year with many visitors to their table on the showroom floor, lots of free comics given away and a host of new members joining the Society. The last of the events was the CCAS panel hosted again by Leo Partible on Sunday morning. Writer/artist Robert Luedke (Eye Witness) gave a short, but inspiring sermon to the packed room, starting with the unusual question, “Do you smell?” This lead to an explanation of our aroma and whether we smell of life or death to the world around us. The panel also included Clint Johnson (Faith Walker), Robert H. Flores (CCAS), Jerrell Conner (Revelations: The Prophets), and Sergio Cariello (The Lone Ranger). Luedke mentioned that comics are the easiest way to share a message in a creative fashion, quoting creator Doug TenNapel (Earthworm Jim) who stated that he does not have access to millions of dollars to make a film, but is able to produce quality comics on a much smaller budget. The main thrust of the morning was a challenge to fellow Christian creators to identify their gifts and a way to use them. Luedke emphasised the fact that creative talents are spiritual gifts, while Cariello encouraged us to no be afraid of who God has created us to be, noting that often times, Christians can be stricter on themselves than God is. Both also mentioned that they don’t hide their faith from the mainstream press and have been bold in declaring their Christianity in interviews, with God blessing them for it. The future of Christian comics looks to be in good hands. 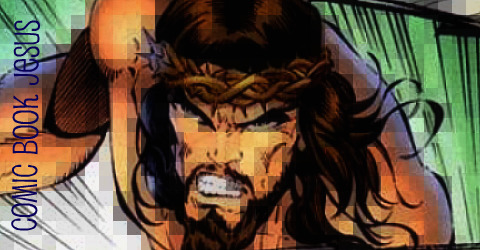 There are some genuinely exciting books out there and a number of mainstream artists working in The Big Two who are writers and artists of faith, all glorifying the Original Creator. 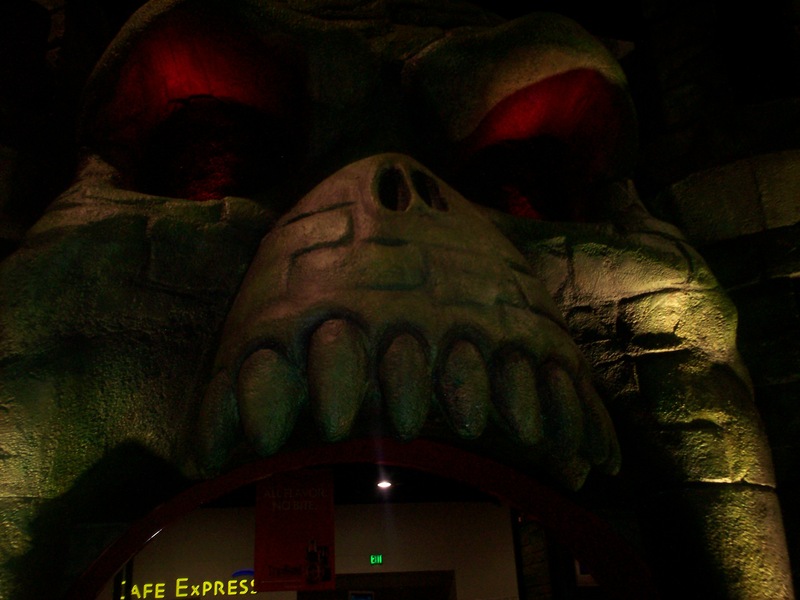 I’ve written all about my travels from Perth to sunny San Diego for the Comic-Con and what it was like for a first-timer. You can check it out here. There’s even two new pics. Enjoy! Ian Sattler from DC Comics never turned up, but Van Sciver went ahead without a moderator anyway and did a splendid job. I remember his indie days back in the 90s as creator of Cyberfrog. How much has changed since then, not only his success as an artist, but also his ability. Comparing his work on DC from the last few years to his earlier work makes it look like two different artists. At the panel, he talked about his exclusive work for DC Comics, mainly centered on the expanding mythology of Green Lantern and his current work on the Sinestro Corps off-shoot, Blackest Night, where he is designing thousands of different GL costumes from every sector of the galaxy. Yes, he’ll be a busy boy for a while. He also expanded on the recently announced, Flash: Rebirth mini, which he’ll be working on with writer Geoff Johns. It will be six issues and will focus on Barry Allen’s return to the DCU, after his noble sacrifice twenty years ago in Crisis on Infinite Earths. Similar to the Green Lantern: Rebirth series from a few years ago, (also written by Johns) which followed Hal Jordan’s return as the foremost GL, this mini will follow Barry as he integrates in to society. He then asked for the audience to respond to Barry’s return. So we did with a round of applause. Van Sciver seemed relieved. He also excitedly mentioned that the last issue of Rebirth will show us the Speed Force in a way that’s never been seen before. The words, “in real-time,” were used, so how he manages that is anyone’s guess. Should be great. He likens Barry to King Arthur and current Flash Wally West (and nephew of Barry) to Lancelot, and assured that us that Wally was not going anywhere. Fans had similar concerns about GL Kyle Rayner when Hal returned, so it’s great to see the Flash I grew up with is staying put. He will also redesign Wally’s costume, to set him apart from Barry, and compared Sinestro to Hitler, in that he’s a sadistic, egotistical madman. His aim is to never draw Sinestro smiling to show his dark side. Working with Johns has been an encouraging experience for him and he’s allowed himself to be more forthcoming with ideas to Johns, despite fear of rejection. 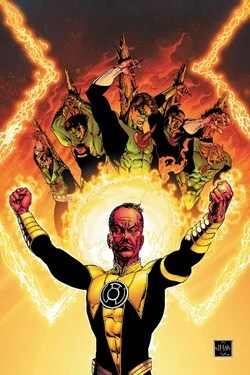 It seems to be working, as his idea of opening up the “emotional spectrum,” to include rings other than of the green variety propelled Johns to scribe the epic and ongoing Sinestro Corps War. They have plans for a while yet and Van Sciver was surprisingly deep when talking about what each colour represented, from greed and hatred, to fear and hope. He’s obviously an artist that thinks deeply about his work and what fresh directions any given story can head towards. After talking about Flash and GL for most of the hour, he expanded on further topics, including an odd Superman lawn sprinkler from his youth, being influenced by Moebius on his interprettion of Batman (with an emphasis on the Bat), and following penciller Frank Quietly on New X-Men in his short, but unsatisfying run with Marvel. The hour sped by and Van Sciver seems to be enjoying his relationship with DC and creative collaboration with the extraordinary Johns. I’m glad to see his detailed and dynamic pencils will grace the pages for an exciting future. Another 7 hours that sped by. I managed to do a lot more shopping today though. By dinner time, my backpack was about to collapse under the sheer weight of..wait for it..16 TPBs, a bunch of free mags and comics, some shirts for the family, and two DVDs. I had to go home to minimise my chiropractor bill. I’ve decided that tomorrow will be my filming day. I’ve taken a bunch of photos already, but the hotel’s slow PC charges by the minute and takes about that long to upload each pic. When I return home on August 3, watch this space for an influx of happy pics and videos. I would’ve liked to have seen film-maker Kevin Smith and the new Batman: Brave and the Bold cartoon panels, but I’m not one for lining up with the masses. The convention floor was slightly less packed this afternoon, as all the various screenings and Q&A sessions were under way. I could move around a lot easier and spend more time talking to retailers, without worrying about people waiting behind me. I saw Mark Waid, one of my favourite writers at BOOM! 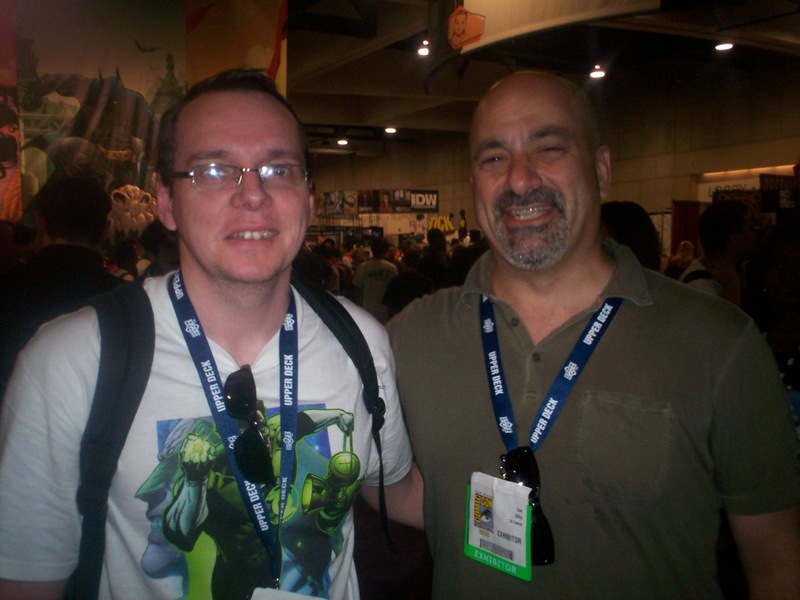 Studios booth, and Dan DiDio, head of DC Comics, and managed to sneak in a photo with him before he left in a hurry. 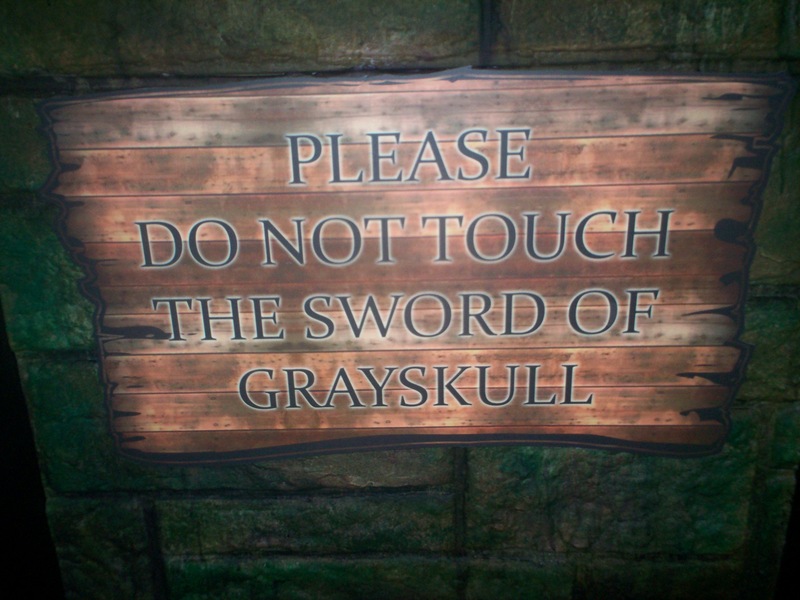 Nothing personal, I’m sure. I also chatted to creators Rod Espinosa (The Prince of Heroes) and David Hutchinson (Biowulf) at the Antarctic Press booth about their careers. 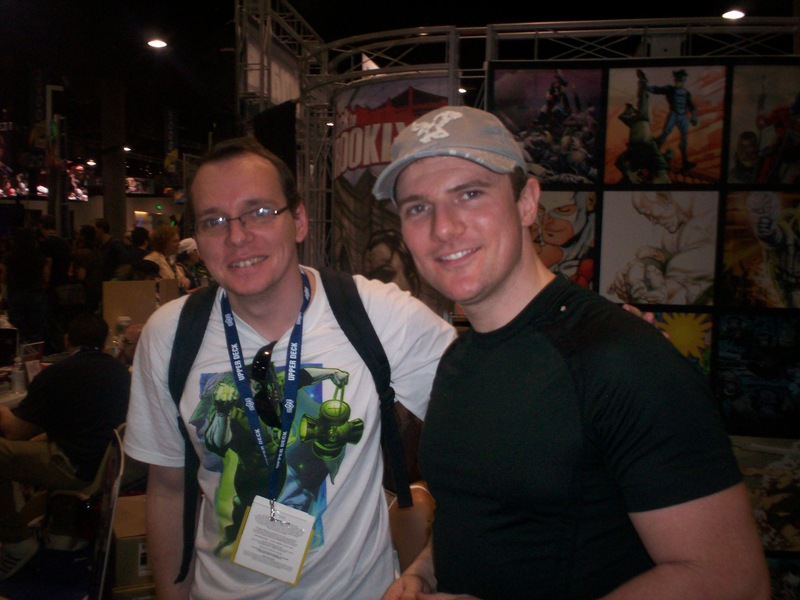 Then I saw David Mack. What a nice guy. I told him that his work on Daredevil and Kabuki was a hit with some of my mates from work and showed them the beauty that comics could reveal. Mack’s art really is amazing and his work as writer/artist on Kabuki is an experimental joy. He was genuinely happy to hear that his work had opened the eyes of a few comic novices and was very warm and friendly. I picked up his Kabuki Vol. 1 TPB and a DVD focusing on his craft, which I can’t wait to see. The process of an artist is always interesting one. He also threw me a handful of free, signed Kabuki books. I told you he was a nice guy. Oh and I took a photo with him too, just to make my mates jealous. Handing out a bunch of my cards to a few companies in the small press section was a joy. They all seem happy enough to add mine to their growing collection. One of the main things that has surprised me is how many people are aware of Perth. I thought my sleepy little town would go unnoticed in this with-it metropolis. Good to see us little people aren’t forgotten. The last stop of the day was a visit to the freebies table. Well, I thought it was the last stop, until I saw a flyer for the CCAS. 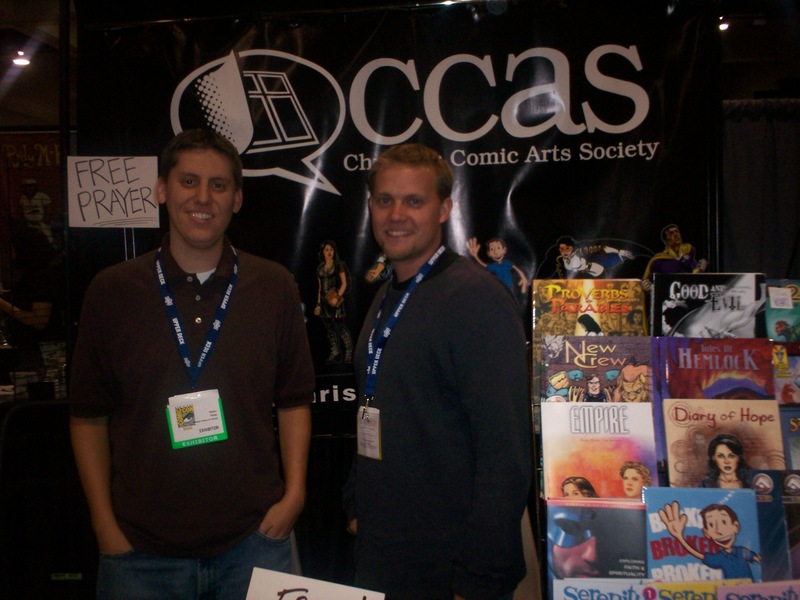 That’s the Christian Comic Arts Society. I was struggling to contain all my goodies with the only two hands God has given me, but I knew I had to visit this booth. I spoke with the two friendly guys there for a while as we discussed the thriving Christian comic creators community, my work for INFUZE and a bunch of other stuff. With their, “Free Prayer” sign they stand out from the crowd, that’s for sure. Over the last two days of the Con, they have three panels, which I will do my best to attend. I should be in my element there and make some interesting contacts. All in all; an eventful day. My budget has pretty much evaporated, but then again, I’m surprised it’s lasted this long.